It turns out Kashi wasn’t the only “natural” cereal brand kicked out of Green Grocers because it contained genetically engineered grains (GMOs) and pesticide residues. Three other cereal brands also got the boot at the Portsmouth, RI natural foods retailer: Barbara’s Bakery, Peace and Bear Naked. Many consumers apparently still equate the word “natural” with pure, healthy, wholesome foods whereas only foods that are certified organic are free of GMOs, toxic pesticides, fumigants and solvents. Customers were also surprised to discover Kashi is owned by Kellogg, the mastermind behind Fruit Loops and Frosted Flakes. Understandable, since the Kellogg name is missing from Kashi cereal boxes. Though Kellogg acquired Kashi in 2000, Kashi is still described on its web site as a small company with fewer than 70 “passionate people.” Whatever Kashi once was, it now produces only 4 certified organic cereals out of 24. Another Kellogg acquisition, Bear Naked, is equally shy about mentioning the Kellogg name on both its’ packaging and website. Started in a home kitchen by two young entrepreneurs, Bear Naked was sold to Kellogg for $60 million in 2007. Though it was never organic, Kellogg now markets the product as “100% pure and natural” even though the cereal is grown and processed with conventional methods and Bear Naked has no policy against the use of hexane, harmful pesticides and GMOs. Until 2008 all Peace Cereals were organic. Then in 2010 the company was bought by Heartside food Solutions, a large contract manufacturer of breakfast foods with 12 manufacturing facilities. Today none of their cereals are organic. Heartside Solutions is owned by a private equity firm. Founded in 1971, homey sounding Barbara’s Bakery was sold to a British cereal manufacturer owned by Lion Capital, another financial firm. 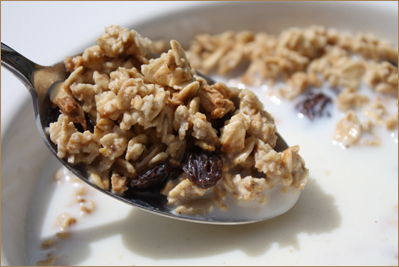 In 2007 55% of Barbara’s Bakery cereals were certified organic. In 2011, only 20% of them were. The cereal maker also removed the USDA organic seal from the packaging of its organic cereals. Now that such a small percent of their products are organic, perhaps the company didn’t want consumers to notice the discrepancy. Cornucopia described the “natural” labels on cereals made with ingredients from chemical intensive farms as “largely meaningless marketing hype.” Sounds like an apt description to me. What’s for Dinner? How about Super-Salmon? I had a small organic farmer in one of my classes this semester who opened my eyes to a variety of challenges they are dealing with. I was noshing on a bowl of grapenuts and yogurt as I read. I’ll bet the grapenuts aren’t organic…but then they don’t advertise themselves as such either. I wasn’t aware GMOs had gotten so pervasive until I did this piece. Though I was CERTAINLY aware of Big Food’s deceptive tactics to sell their products. I think organic farmers have to be really tough people to stand up to companies like Monsanto. I read about this “natural” scam in Michael Pollan’s book The Omnivore’s Dilemma: A Natural History of Four Meals. Sadly, he takes on various “organic” companies as well. It’s hard to know what certifications to trust! To think that years ago I used to think Food was a pretty boring subject. Now, it’s pow-pow-pow with all the deception and duping and craziness, thanks to Big Food’s march toward ever bigger bucks. It would be nice to get a break from the constant degree of diligence we seem to need to stay ahead of these hucksters. Organic foods are always the best since they do not contain trace amounts of pesticides and other harmful chemicals.